A plastic garbage contain left on top of a burner that was accidentally turned on sparked a house fire in north Spokane Sunday evening that killed three dogs. Smoke was coming from the back of the house in the 4900 block of N. Crestline when the Spokane Fire Department arrived about 4:41 pm. Crews quickly knocked down the fire and removed three dogs from the house. The occupant of the home, who was not at home at the time of the fire, had left a plastic garbage container on the stove. One of the burner controls was accidentally turned on and the garbage container melted, catching a nearby pantry on fire. No one was injured, but all three dogs perished in the blaze. The Red Cross is assisting the occupant with temporary living arrangements. 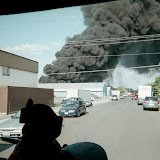 The Spokane Fire Department would like to remind the public to keep combustibles away from heat sources. Burners can easily be turned on by accident. Don’t take chances, keep potentially hot surfaces clear.